The Hong Kong Reference Framework for Hypertension Care for Adults in Primary Care Settings is updated regularly to ensure it reflects the latest medical development and best practice. In 2017, guidelines from the United States included a major change, adopting the lower blood pressure values of 130/80 mm Hg in defining hypertension, in contrast to the prevailing international consensus of 140/90 mm Hg. After thorough review of the literature and international guidelines, the Advisory Group on Hong Kong Reference Framework for Care of Diabetes and Hypertension in Primary Care Settings (Advisory Group) recommends that the definition of hypertension adopted in the Reference Framework should remain unchanged as a blood pressure of ≥140/90 mm Hg, as there is currently inadequate evidence and lack of general consensus to support such change in Hong Kong. The Advisory Group agrees on individualised treatment goals, and recommends that the initial blood pressure goal for individuals with uncomplicated hypertension should be <140/90 mm Hg; for those who can tolerate it, the goal should be ≤130/80 mm Hg. A lower blood pressure is advisable for young or overweight/obese patients, smokers, and patients with other cardiovascular risk factors. Hypertension is an important cardiovascular risk factor and the commonest chronic disease in Hong Kong, with a prevalence of 27.7% among people aged ≥15 years.1 The Primary Care Office of the Department of Health first published the Hong Kong Reference Framework for Hypertension Care for Adults in Primary Care Settings (Reference Framework) in 2010.2 Drawing on international evidence of best practice, the Reference Framework provides an evidence-based reference to primary healthcare professionals in the identification and management of hypertension in Hong Kong. To ensure the Reference Framework reflects latest medical development and evidence, it is updated regularly with expert advice from the Advisory Group on Hong Kong Reference Framework for Care of Diabetes and Hypertension in Primary Care Settings (Advisory Group). The Advisory Group comprises representatives from academia, relevant Colleges of the Hong Kong Academy of Medicine, and professional organisations. In 2017, the American College of Cardiology (ACC) and the American Heart Association (AHA) released guideline recommendations using lower blood pressure (BP) values to define hypertension as systolic BP (SBP) ≥130 mm Hg and/or diastolic BP (DBP) ≥80 mm Hg.3 This recommendation is in contrast to the prevailing consensus of SBP ≥140 mm Hg and/or DBP ≥90 mm Hg adopted by the World Health Organization and other international guidelines.4 The BP goal of hypertensive therapy was also lowered to <130/80 mm Hg in the new ACC/AHA guideline.3 It is foreseeable that these new recommendations would arouse concern regarding the diagnosis and management of hypertension at individual patient care level, as well as issues related to disease labelling, changes in epidemiology, and the applicability of these recommendations to other populations. Even within the United States, the recommendations in this guideline were not unanimously agreed with among different authorities, and the application of these recommendations remains controversial.5 6 There is also little understanding of how these recommendations translate to non–United States populations, and there is currently no general consensus on the adoption of these recommendations in Hong Kong. 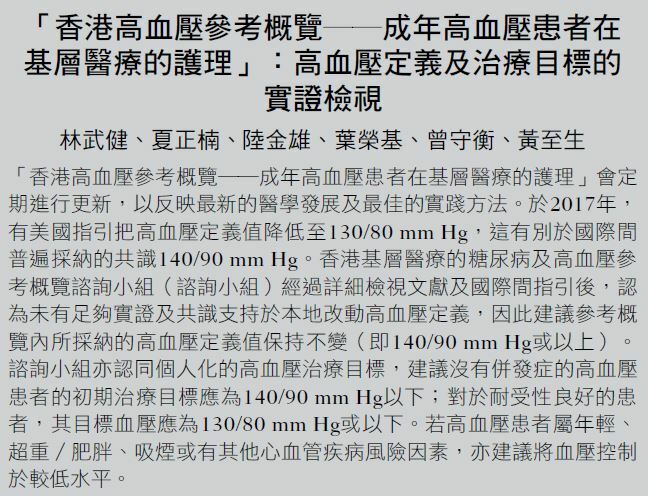 The aim of this study was to review the relevant literature, discuss the benefits and potential harms of setting lower BP values in the diagnosis and management of hypertension, and suggest updated recommendations on care for individuals with uncomplicated hypertension in the context of the primary care settings in Hong Kong. What does the current evidence say? There was concern regarding the use of unattended automated office BP in the SPRINT trial; automated office BP had not been used in any previous major randomised controlled trials (such as ACCORD) on BP-lowering treatment.23 When compared with conventional office BP measurement, automated office BP may result in lower BP values due to the absence of the white-coat effect. Therefore, it has been suggested that the BP values reported in SPRINT may actually correspond to conventional office SBPs of 130 to 140 mm Hg and 140 to 150 mm Hg in the more intensive and less intensive BP-lowering treatment groups, respectively.7 It is unclear if these findings can be extrapolated to hypertensive patients in Hong Kong. The Advisory Group regularly reviews the latest scientific evidence and recommendations from different professional organisations. The Advisory Group has noticed that there is currently inadequate evidence and lack of general consensus to support a change to the definition of hypertension in Hong Kong. Therefore, the Advisory Group agreed that the Reference Framework definition of hypertension should remain unchanged as a BP of ≥140/90 mm Hg. Hypertensive patients are known to have a higher cardiovascular risk if they have other risk factors such as smoking, obesity, sedentary lifestyle, or elevated lipids or glucose; hence, a global risk approach should be included in assessing the cardiovascular risk of an individual patient.32 Although some evidence has suggested that a lower BP may provide greater benefit for patients with higher cardiovascular risk, there is also an increased risk of treatment noncompliance and serious adverse events from treatment if the BP is pushed too low, especially in older patients. It is, therefore, appropriate to determine the treatment goal on an individual basis after balancing the benefits and potential harms of having a lower BP goal in the context of that individual. Taking these into account, the Advisory Group endorses the approach of setting the BP goal with the consideration of age, underlying cardiovascular risk factors, and tolerability to treatment of the individual patient, instead of a single BP goal for all patients. This approach echoes the recommendation of recently published international guidelines.7 The Advisory Group recommends that the initial BP goal of therapy for individuals with uncomplicated hypertension should be <140/90 mm Hg; and for individuals who can tolerate it, the BP goal should be ≤130/80 mm Hg. A lower BP is advisable for young or overweight/obese patients, smokers, and patients with other cardiovascular risk factors. Hypertension is an important cardiovascular risk factor and the commonest chronic disease in Hong Kong. Primary care physicians play an important role in the early diagnosis, prompt assessment and proper management of hypertension. The Reference Framework aims to provide updated evidence-based recommendations to support and influence the current practice of primary care physicians in Hong Kong, and to reduce the burden of long-term cardiovascular sequelae for hypertensive patients. All authors have contributed to the concept or design of this study, acquisition of data, analysis or interpretation of data, drafting of the manuscript, and critical revision for important intellectual content. All authors had full access to the data, contributed to the study, approved the final version for publication, and take responsibility for its accuracy and integrity. We would like to thank the members of the Advisory Group for their invaluable contributions in the development and update of the Reference Framework. As an editor of the journal, MCS Wong was not involved in the peer review process. All other authors have disclosed no conflicts of interest. 1. Centre for Health Protection, Department of Health, Hong Kong SAR Government. Report of Population Health Survey 2014/2015. Available from: https://www.chp.gov.hk/en/static/51256.html. Accessed 15 Oct 2018. 2. Primary Care Office, Department of Health, Hong Kong SAR Government. Hong Kong Reference Framework for Hypertension Care for Adults in Primary Care Settings. Revised edition 2018. Available from: https://www.pco.gov.hk/english/resource/professionals_hypertension_pdf.html. Accessed 15 Oct 2018. 6. Crawford C. AAFP decides to not endorse AHA/ACC Hypertension Guideline: Academy continues to endorse JNC8 Guideline. Available from: https://www.aafp.org/news/health-of-the-public/20171212notendorseaha-accgdlne.html. Accessed 8 Oct 2018. 32. World Health Organization. Prevention of cardiovascular disease. Guidelines for assessment and management of cardiovascular risk. Available from: http://www.who.int/cardiovascular_diseases/guidelines/Full%20text.pdf.Accessed 12 Oct 2018.